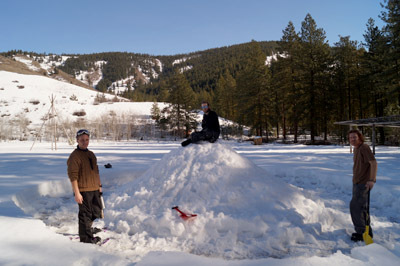 Here are some highlights from the time between December and February with the Alderleaf Wilderness Certification Program. It has been a busy, exciting and surprisingly sunny winter season! 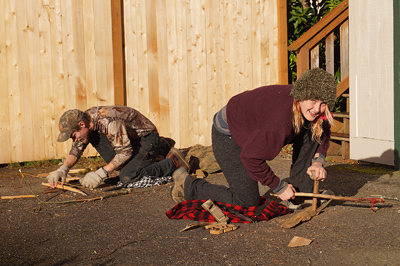 In the photo above, two students are working hard on their wild bow drill test. This involves using only wild harvested parts and cordage or a shoelace as a bow string. To successfully pass the test, students must make a coal and blow it into a flame. 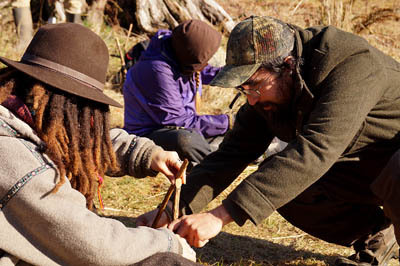 Instructor Jeremy assists a student in setting up a figure-4 deadfall trap during our traps and snares class day. These primitive traps can be used to procure wild game in a survival situation. 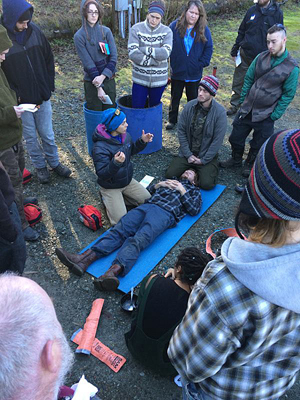 During the Wilderness First Aid Certification training, students learned skills vital for back-country safety. Here instructor Rachel describes the proper way to tend to an injured person, using splints, being efficient yet considerate of the person's comfort, and stabilizing the head and spine. 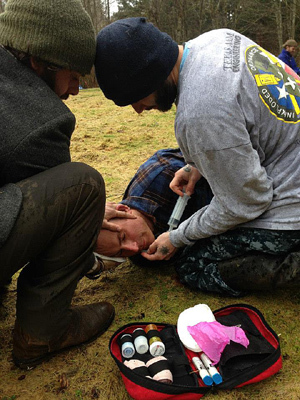 In the same class, two students tend to a mock victim, and bandage wounds, stabilize his spine and clear his airways. Such mock scenarios are vital for training under pressure. 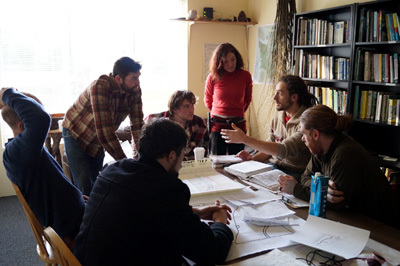 A group of students discuss a permaculture design for a local property with the assistance of instructor Dave Boehnlein. During our winter trip to the North Cascades Mountains, students got to experience building and sleeping in several kinds of snow shelters. 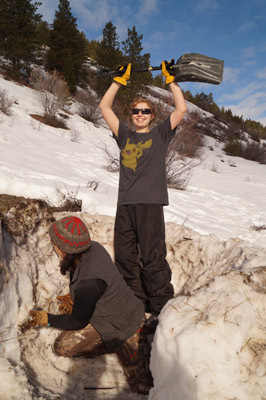 Instructor Georgie and student Mino work together to build a snow trench winter survival shelter. Apprentice instructor Bernard and students next to a nearly completed quinzee snow shelter. 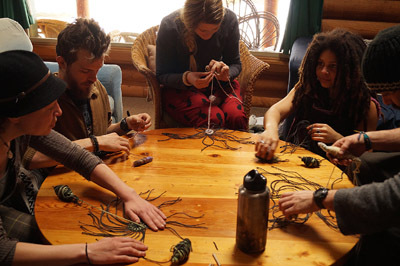 Here students work together on the craft of making woven bags. The past few months of classes have flown by so quickly. 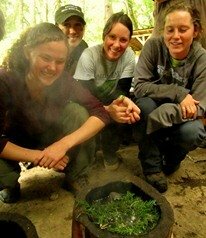 There are many exciting class days, projects and experiences ahead for students in the Alderleaf Wilderness Certification Program. Watch for more updates on our adventures soon!